Pima County officials will reopen the Roland (Rolly) Thomas Widman BMX Park on Saturday, Oct. 8, at a 9 a.m. dedication ceremony at the park, located at Winston Reynolds Manzanita Park, 5200 S. Westover Ave. The park was originally built in 1995 by Rex Widman of Rexcavating LLC and members of the 162nd Wing Arizona Air National Guard in honor of Widman’s brother Roland Thomas Widman (Rolly), who died of cancer in 1992. Shortly before his death, Roland asked Rex to build a community park to be named in his honor. Speakers at the event include District 5 Supervisor Richard Elías, Rex Widman, and former park operators Julie and Kirk Vaughn. 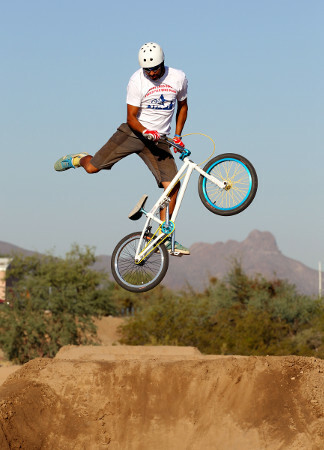 Pima County Natural Resources, Parks and Recreation had an operator to run the “Rolly” BMX Park as a competitive track. New operators took over the park in 2000 and ran it until 2013 when the operators moved to Xtreme Fun Spot BMX in Mike Jacob Sports Park. The Rolly BMX Park remained shuttered until now. The redesigned Widman BMX Park has three pump tracks, two intermediate levels and one beginner level for both BMX bikes and mountain bikes. Use of the park is free and open to all age groups. Winston Reynolds-Manzanita Park has undergone several renovations and upgrades in the past two years in addition to the redesign of the old BMX park. Among the amenities are new bleachers, new walking paths around the perimeter of the park, a repaired and resurfaced basketball court and two tennis courts, renovation of five ramadas, installation of new picnic tables, a new shade structure outside the swimming pool with two benches. Improvements total more than $500,000.